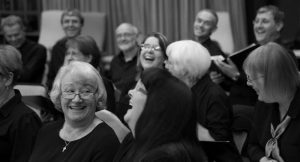 A440 Choir welcomes interest from anyone who might like to join us. Existing members reflect a wide range of work interests, backgrounds, ages and levels of musical experience. We would love to hear from you if you think A440 might be the choir for you. Come and join a rehearsal or come to one of our concerts to see and hear us in person. We rehearse on Wednesday evenings from 7:45pm to 10pm during term time, at Woodley Baptist Church, in Reading. (Occasionally events and rehearsals can also happen outside term time.) We perform 6-8 concerts a year (1 every 4-6 weeks on average) and enter competitions when possible. A singing commitment to ensure music is learnt to the highest possible standard in a given time. This includes learning some music by memory so it can be performed ‘off copy’ (rehearsal audio files are available to help with this). A friendly welcome and opportunity to socialise, both at rehearsals and other planned events. Opportunity to sing a wide range of musical genres at events that often involve collaboration with other performers and art forms. Members currently pay a subscription of £50 per term, or £150 per year (reviewed annually) with a young members 50% reduction for those under 30 years of age. New applicants will be invited to come along to rehearsals for up to 4 weeks on a probationary basis. This allow us all to get to know one another before you decide whether you want to commit to joining as a full member. If after 3-4 rehearsals you confirm your wish to join, a short audition will then be arranged for you with the choir’s MD. The audition itself is relaxed and nothing to worry about. It’s only to verify some basic vocal abilities. Most people who can sing in tune with a pleasant voice will pass easily. Overall we are looking for people who bring a positive attitude, aptitude and skill base to choral singing. If you would like more information about joining Reading A440 Choir then please email readingA440@gmail.com – we look forward to hearing from you.